Get Smart with Smart Technology Accessories! With smart technology dominating the market in recent years and the trend still rising it's time to jump on the bandwagon! More and more businesses are operating from devices such as tablets and smart phones whilst in the office and on the road. Silveradoh Promotional Products is supplying Australia with the latest in technological accessories to compliment the use of laptops, tablets and phones. All our accessories are branded with your logo to ensure maximum promotion for your business. We also find that money spent on technological promotional items results in money well spent as receivers of your promotional product are likely to not only keep the item but use it on a day-to-day basis. Silveradoh Promotional Products can supply you with branded earphones or headphones. 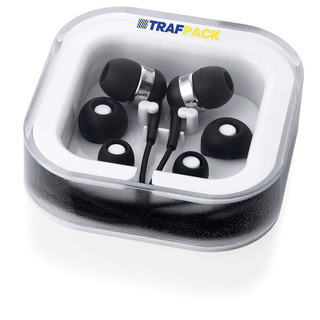 Most earphones and headphones come in handy travel packs so it is easy for the receiver of your promotional item to throw it in their handbag or backpack to be used time and time again. Promotional branding can also be done on either the case or earphones/headphones depending on the item chosen or your preference. Promotional speakers are also becoming increasingly popular on the promotional product market with new additions being added consistently as competition increases. From speakers for your shower right through to executive speakers for the boardroom, there is sure to be a promotional speaker that is right for your requirements. Promotional branding also ensures your speaker will look professional and it will never stop promoting your business for you! Silveradoh Promotional Products can supply you with branded tablet holders and cases. When Tablets/iPad's are used to conduct business they can become one of your most valuable assets and the thought of one of them cracking can be overwhelming. Protect your tablets and iPhones using promotional cases. By branding executive cases you will continue to stand out and look professional amongst competitors. Promotional stylus pens are becoming one of Silveradoh Promotional Products most popular types of pen. The promotional pen has always been the most sought after promotional item so it is natural that adding a stylus to the top it will continue to remain in a league of its own. With cheaper plastic versions of the stylus pen through to metal executive types currently on the market, there will always be a promotional stylus pen to suit your budget. With such a huge print area for your corporate branding, microfiber lens cloths are also on the rise. When your devices are being used constantly they are quick to become covered in fingerprints and marks. Microfiber lens cloths ensure your staff or clients can easily clean their devices with the wipe of a cloth! As a cheaper promotional product, they are also perfect as a giveaway item. Receivers of the item can keep them in their car, laptop case, handbag or backpack to be used over and over again. As they are paper thin, promotional lens cloths are also perfect for mailing to your clients. So isn't it time you jumped on the smart technology bandwagon? Call Silveradoh Promotional Products on 02 4956 7522 or email sales@silveradoh.com.au and let us help you make it easy!